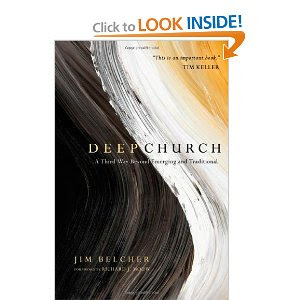 Jim Belcher, in his book Deep Church, sincerely feels he is offering a third way between the traditional and emerging church, but in the end it is just diving down deeper into the traditional church side of the pool. Which, by the way, is fine with me. Let me now share a couple concerns that I had with the book. The Bible + Tradition + Mission = Deep Ecclesiology (p. 173). Wow, see I told you he is honest (in part one of this review). Honesty aside, this recipe can produce a whole lot of bad stuff. This is actually the very formula that created the Pharisaical legalism that Jesus and Paul fought so hard against. The Old Testament (Bible) + the oral law or Talmud (Tradition) + Mission = Legalistic Judaizers. This formula can endorse doctrinal abuses such as purgatory, RC priesthood and sacraments, and even indulgences (selling a ticket to heaven) all with the same basis of authority. The problem that Belcher will run into is that the creeds he considers the Great Tradition do not at all address church practice, which is actually where most of the frustration comes into play between the emerging and traditional churches. I do not find anything I object to in the three creeds he includes (I’m not too comfortable with the way the Athanasius Creed reads, but push comes to shove I agree with its content), so simply agreeing on these does nothing to bridge the vast difference Belcher and I have for what church is and how it works. At that point, Belcher is then forced to appeal to certain church fathers and practices that tend to have the greatest amount of acceptance by the church over the centuries. Frankly, I am very uncomfortable with that. We can all pick and choose which fathers we like best and it does nothing to bring us to consensus. We all find at the end of the day that church tradition lacks the authority needed to speak to the issues we are facing today. The second thing I didn’t like was a blatant disregard of the Anabaptist non-creedal point of view. At first I wanted to just chock that up to naïveté, but as I kept reading Belcher proved to be too well read and thought out to be that ignorant. Perhaps in his devotion to finding a way to blend his passion for tradition with his learning in the emerging church world that he could only find a compromise in a world that accepts his Great Tradition. Unfortunately, there are many who are non-creedal doctrinally and that prevents such a compromise. Being non-creedal is actually a value for many, myself included. The Anabaptists wanted nothing to be held as authority but the word of God, and so even a well worded and agreeable creed is incapable of standing on the same ground as the bible. Scripture is universal truth that will not fade with time, but the doctrines and systems of men are not that way. As time progresses and culture shifts so does one’s perspective. Creeds are written by men in response to an historical context, and therefore bound by the culture in which they were written. They are not inspired by God and therefore by nature are capable of being erroneous, imbalanced or incomplete as we learn more things with progressive revelation. But perhaps more than that, when you put anything at the same level of Scripture two harmful things happen: the authority of scripture is weakened and the authority of the tradition is elevated to the status of the Bible. That is the most dangerous part, which leads to abuses over time. Finally, I was a little put off by his reformed bias. Frankly, with the upsurge of reformed thinkers today there is a growing Calvinistic culture that borders on bigotry at times. Jim Belcher is not an arrogant or bigoted man, from what I read, but nonetheless the neo-Reformed view has left a residue on him that comes out at times. Perhaps the best example to demonstrate this is whenever he had nagging doubts about emerging church viewpoints, he called them “Calvinist misgivings.” What is wrong with this? Well trust me, having misgivings about philosophy that borders on (or crosses over into) relativism is not the exclusive territory of Calvinists! Calvinists are not the only ones smart enough to be troubled by this encroachment on truth. This Neo-Reformed group consistently draws lines that become boundaries and are often as committed to their bounded-set as any staunch traditional church “heresy hunter.” To help illustrate this point I am going to use an example from a friend of mine--Mark Driscoll (I think he can handle the controversy). When explaining the same categories of the emerging church mentioned in the first part of this post, Driscoll (one of the prominent leaders of the Neo-Reformed movement) actually added a forth category: the Reformers According to Mark there are reformers (not changing structure or doctrine & reformed), Relevants (not changing structure or doctrine, not totally reformed), Reconstructionists (changing structure but not doctrine) and Revisionists (changing doctrine). The Reformers, according to Drischoll are the same as the Relevants except they also hold to a reformed doctrine. My question then is do we also want to have Reformed Reconstructionists and Reformed Revisionists because there are reformed folk in those “camps” too. Why not have Dispensational Relevants and Dispensational Revisionists as well? It is quite common for these guys (and yes it is almost exclusively men) to cite as their heroes Augustine, Luther, Calvin, Edwards, Kyuper, Spurgeon, Lewis, Schaeffer, Keller and Packer and any other very intellectual leader in church history as if the rest of us can’t claim them as our heroes. As a protestant I can tell you I have benefited from these people and consider them fathers of my Christianity as well, even though I do not sign off on all five pedals of the Calvinist tulip. This is the sort of attitude I am bothered by. Driscoll draws lines in as bounded-a-set as one can. He goes so far as to describe the Reconstructionists (he actually uses me as an example of this "camp") as on the same highway, but not in the same lane. “We’re not going to run them off the road or do any drive by shootings against them, but were not in the same lane.” Frankly, speaking as one of the Reconstructionists, that is not a healthy way to work together as the body of Christ. Don’t confuse Drischoll’s strong Irish fighter stance (I can say that because he does, and I am also Irish and a fighter) with Belcher, because Belcher’s tone is conciliatory, friendly and respectful. But on occasion, I felt like he was unaware of how much his immersion in the reformed subculture has rubbed off on him in ways that might come across to others as a little insulting. I'm sure that I have the same blind tendency from an Anabaptist tradition, and if so we both need to talk, and work together, not draw lines and ignore each other. It is not enough to simply not shoot at each other in a drive by shooting. Frankly, I like Mark and have considered him a friend for many years now. Two times in my life I can connect a radical change in my life to hearing Mark preach a message, so as far as I am concerned I am one of his friends, but I am not a full-fledged, card carrying, Calvinist. I hope that the neo-Reformers can accept that and we can work together to change the world, even if we do not appeal to the Great Tradition to do it. Well written, Neil. I agree with you that Jim's idea of a third way between the 'inherited' and 'emerging' styles of church is not really a third way at all, but just a 'deeper' version of the one he leans most towards. Having said that, I think there was a lot of food for thought in the book - and I too enjoyed it and found Belcher very likeable - but am glad that you have provided some balance with your own spin on things. As for the Ed Stetzer/ Mark Driscoll categories - I agree that this needs some work and expansion because it is too restrictive and narrow - but it is a good starting point for discussion. Thanks for the posts - I found them really useful. A New Release is Coming, Well Sort of.